Amyloid precursor protein (APP) is an integral membrane protein expressed in many tissues and concentrated in the synapses of neurons. Its primary function is not known, though it has been implicated as a regulator of synapse formation and neural plasticity. APP is best known and most commonly studied as the precursor molecule whose proteolysis generates amyloid beta (Aß), a 39- to 42-amino acid peptide whose amyloid fibrillar form is the primary component of amyloid plaques found in the brains of Alzheimer's disease patients. In humans, the gene for APP is located on chromosome 21 and contains at least 18 exons in 240 kilobases. Several alternative splicing isoforms of APP have been observed in humans, ranging in length from 365 to 770 amino acids, with certain isoforms preferentially expressed in neurons; changes in the neuronal ratio of these isoforms have been associated with Alzheimer's disease. Homologous proteins have been identified in other organisms such as Drosophila (fruit flies), C. elegans (roundworms), and all mammals. The amyloid beta region of the protein, located in the membrane-spanning domain, is not well conserved across species and has no obvious connection with APP's native-state biological functions. Mutations in critical regions of Amyloid Precursor Protein, including the region that generates amyloid beta, are known to cause familial susceptibility to Alzheimer's disease. For example, several mutations outside the Aß region associated with familial Alzheimer's have been found to dramatically increase production of Aß. A number of distinct, largely independently-folding structural domains have been identified in the APP sequence. The extracellular region, much larger than the intracellular region, is divided into the E1 and E2 domains; E1 contains several subdomains including a growth factor-like domain (GFLD), a metal-binding motif, and a serine protease inhibitor domain that is absent from the isoform differentially expressed in the brain. The E2 domain contains a coiled coil dimerization motif and may bind proteoglycans in the extracellular matrix. The extracellular E2 domain, a dimeric coiled coil and one of the most highly-conserved regions of the protein from Drosophila to humans. 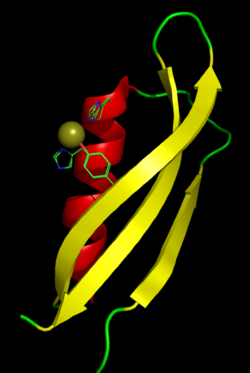 This domain, which resembles the structure of spectrin, is thought to bind heparan sulfate proteoglycans. The complete crystal structure of APP has not yet been solved; however, individual domains have been successfully crystallized, including the copper-binding as well as a zinc-binding domain in multiple configurations and ion-binding states and the E2 dimerization domain. The metal-binding domain of APP with a bound copper ion. The side chains of the two histidine and one tyrosine residues that play a role in metal coordination are shown in the Cu(I) bound, Cu(II) bound, and unbound conformations, which differ by only small changes in orientation. APP undergoes extensive post-translational modification including glycosylation, phosphorylation, and tyrosine sulfation, as well as many types of proteolytic processing to generate peptide fragments. It is commonly cleaved by proteases in the secretase family; alpha secretase and beta secretase both remove nearly the entire extracellular domain to release membrane-anchored carboxy-terminal fragments that may be associated with apoptosis. Cleavage by gamma secretase within the membrane-spanning domain generates the amyloid-beta fragment; gamma secretase is a large multi-subunit complex whose components have not yet been fully characterized, but include presenilin, whose gene has been identified as a major genetic risk factor for Alzheimer's. The amyloidogenic processing of APP has been linked to its presence in lipid rafts. When APP molecules occupy a lipid raft region of membrane, they are more accessible to and differentially cleaved by beta secretase, whereas APP molecules outside a raft are differentially cleaved by the non-amyloidogenic alpha secretase. Gamma secretase activity has also been associated with lipid rafts. The role of cholesterol in lipid raft maintenance has been cited as a likely explanation for observations that high cholesterol and apolipoprotein E genotype are major risk factors for Alzheimer's disease. Although the native biological role of APP is of obvious interest to Alzheimer's research, thorough understanding has remained elusive. The most-substantiated role for APP is in synaptic formation and repair; its expression is upregulated during neuronal differentiation and after neural injury. Roles in cell signaling, long-term potentiation, and cell adhesion have been proposed and supported by as-yet limited research. In particular, similarities in post-translational processing have invited comparisons to the signaling role of the surface receptor protein Notch. APP knockout mice are viable and have relatively minor phenotypic effects including impaired long-term potentiation and memory loss without general neuron loss. On the other hand, transgenic mice with upregulated APP expression have also been reported to show impaired long-term potentiation. The logical inference is that because Aß accumulates excessively in Alzheimer's disease its precursor, APP, would be elevated as well. However, neuronal cell bodies contain less APP as a function of their proximity to amyloid plaques. The data indicate that this deficit in APP results from a decline in production rather than an increase in catalysis. Loss of a neuron's APP may effect physiological deficits that contribute to dementia. Amyloid precursor protein has been shown to interact with APBA3, CLSTN1, APPBP1, Gelsolin, BCAP31, Caveolin 1, FBLN1, Collagen, type XXV, alpha 1, APBB1, APBA2, APBA1, APPBP2, HSD17B10, BLMH and SHC1. One groups of scientists reports that APP interacts with reelin, a protein implicated in a number of brain disorders, including Alzheimer's disease. 13 Kong GK, Galatis D, Barnham KJ, Polekhina G, Adams JJ, Masters CL, Cappai R, Parker MW, McKinstry WJ. (2005). Crystallization and preliminary crystallographic studies of the copper-binding domain of the amyloid precursor protein of Alzheimer's disease. Acta Crystallograph 61(Pt 1):93-5. PMID 16508101. See also 2007 PDB IDs 2FJZ, 2FK2, 2FKL. 22 Barger SW, DeWall KM, Liu L, Mrak RE, Griffin WS (August 2008). "Relationships between expression of apolipoprotein E and beta-amyloid precursor protein are altered in proximity to Alzheimer beta-amyloid plaques: potential explanations from cell culture studies". J. Neuropathol. Exp. Neurol. 67 (8): 773–83. doi:10.1097/NEN.0b013e318180ec47. PMID 18648325. 23 a b c Biederer, Thomas; Cao Xinwei, Südhof Thomas C, Liu Xinran (Sep. 2002). "Regulation of APP-dependent transcription complexes by Mint/X11s: differential functions of Mint isoforms". J. Neurosci. (United States) 22 (17): 7340-51. PMID 12196555. 24 Tanahashi, H; Tabira T (Feb. 1999). "X11L2, a new member of the X11 protein family, interacts with Alzheimer's beta-amyloid precursor protein". Biochem. Biophys. Res. Commun. (UNITED STATES) 255 (3): 663-7. doi:10.1006/bbrc.1999.0265. ISSN 0006-291X. PMID 10049767. 25 Araki, Yoichi; Miyagi Naomi, Kato Naoko, Yoshida Tomohiro, Wada Sachiyo, Nishimura Masaki, Komano Hiroto, Yamamoto Tohru, De Strooper Bart, Yamamoto Kazuo, Suzuki Toshiharu (Jun. 2004). "Coordinated metabolism of Alcadein and amyloid beta-protein precursor regulates FE65-dependent gene transactivation". J. Biol. Chem. (United States) 279 (23): 24343-54. doi:10.1074/jbc.M401925200. ISSN 0021-9258. PMID 15037614. 26 b Araki, Yoichi; Tomita Susumu, Yamaguchi Haruyasu, Miyagi Naomi, Sumioka Akio, Kirino Yutaka, Suzuki Toshiharu (Dec. 2003). "Novel cadherin-related membrane proteins, Alcadeins, enhance the X11-like protein-mediated stabilization of amyloid beta-protein precursor metabolism". J. Biol. Chem. (United States) 278 (49): 49448-58. doi:10.1074/jbc.M306024200. ISSN 0021-9258. PMID 12972431. 27 Chow, N; Korenberg J R, Chen X N, Neve R L (May. 1996). "APP-BP1, a novel protein that binds to the carboxyl-terminal region of the amyloid precursor protein". J. Biol. Chem. (UNITED STATES) 271 (19): 11339-46. ISSN 0021-9258. PMID 8626687. 28 Chauhan, V P; Ray I, Chauhan A, Wisniewski H M (May. 1999). 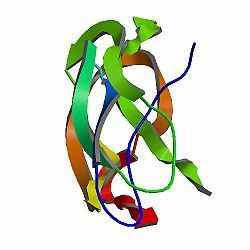 "Binding of gelsolin, a secretory protein, to amyloid beta-protein". Biochem. Biophys. Res. Commun. (UNITED STATES) 258 (2): 241-6. doi:10.1006/bbrc.1999.0623. ISSN 0006-291X. PMID 10329371. 29 Wang, Bing; Nguyen Mai, Breckenridge David G, Stojanovic Marina, Clemons Paul A, Kuppig Stephan, Shore Gordon C (Apr. 2003). "Uncleaved BAP31 in association with A4 protein at the endoplasmic reticulum is an inhibitor of Fas-initiated release of cytochrome c from mitochondria". J. Biol. Chem. (United States) 278 (16): 14461-8. doi:10.1074/jbc.M209684200. ISSN 0021-9258. PMID 12529377. 30 Ikezu, T; Trapp B D, Song K S, Schlegel A, Lisanti M P, Okamoto T (Apr. 1998). "Caveolae, plasma membrane microdomains for alpha-secretase-mediated processing of the amyloid precursor protein". J. Biol. Chem. (UNITED STATES) 273 (17): 10485-95. ISSN 0021-9258. PMID 9553108. 31 Ohsawa, I; Takamura C, Kohsaka S (Mar. 2001). "Fibulin-1 binds the amino-terminal head of beta-amyloid precursor protein and modulates its physiological function". J. Neurochem. (United States) 76 (5): 1411-20. ISSN 0022-3042. PMID 11238726. 32 Hashimoto, Tadafumi; Wakabayashi Tomoko, Watanabe Atsushi, Kowa Hisatomo, Hosoda Ritsuko, Nakamura Atsushi, Kanazawa Ichiro, Arai Takao, Takio Koji, Mann David M A, Iwatsubo Takeshi (Apr. 2002). "CLAC: a novel Alzheimer amyloid plaque component derived from a transmembrane precursor, CLAC-P/collagen type XXV". EMBO J. (England) 21 (7): 1524-34. doi:10.1093/emboj/21.7.1524. ISSN 0261-4189. PMID 11927537. 33 a b Borg, J P; Ooi J, Levy E, Margolis B (Nov. 1996). "The phosphotyrosine interaction domains of X11 and FE65 bind to distinct sites on the YENPTY motif of amyloid precursor protein". Mol. Cell. Biol. (UNITED STATES) 16 (11): 6229-41. ISSN 0270-7306. PMID 8887653. 34 Zambrano, N; Buxbaum J D, Minopoli G, Fiore F, De Candia P, De Renzis S, Faraonio R, Sabo S, Cheetham J, Sudol M, Russo T (Mar. 1997). "Interaction of the phosphotyrosine interaction/phosphotyrosine binding-related domains of Fe65 with wild-type and mutant Alzheimer's beta-amyloid precursor proteins". J. Biol. Chem. (UNITED STATES) 272 (10): 6399-405. ISSN 0021-9258. PMID 9045663. 35 Guénette, S Y; Chen J, Jondro P D, Tanzi R E (Oct. 1996). "Association of a novel human FE65-like protein with the cytoplasmic domain of the beta-amyloid precursor protein". Proc. Natl. Acad. Sci. U.S.A. (UNITED STATES) 93 (20): 10832-7. ISSN 0027-8424. PMID 8855266. 36 Tanahashi, H; Tabira T (Feb. 1999). "Molecular cloning of human Fe65L2 and its interaction with the Alzheimer's beta-amyloid precursor protein". Neurosci. Lett. (IRELAND) 261 (3): 143-6. ISSN 0304-3940. PMID 10081969. 37 Trommsdorff, M; Borg J P, Margolis B, Herz J (Dec. 1998). "Interaction of cytosolic adaptor proteins with neuronal apolipoprotein E receptors and the amyloid precursor protein". J. Biol. Chem. (UNITED STATES) 273 (50): 33556-60. ISSN 0021-9258. PMID 9837937. 38 Tomita, S; Ozaki T, Taru H, Oguchi S, Takeda S, Yagi Y, Sakiyama S, Kirino Y, Suzuki T (Jan. 1999). "Interaction of a neuron-specific protein containing PDZ domains with Alzheimer's amyloid precursor protein". J. Biol. Chem. (UNITED STATES) 274 (4): 2243-54. ISSN 0021-9258. PMID 9890987. 39 Zheng, P; Eastman J, Vande Pol S, Pimplikar S W (Dec. 1998). "PAT1, a microtubule-interacting protein, recognizes the basolateral sorting signal of amyloid precursor protein". Proc. Natl. Acad. Sci. U.S.A. (UNITED STATES) 95 (25): 14745-50. ISSN 0027-8424. PMID 9843960. 40 Yan, S D; Fu J, Soto C, Chen X, Zhu H, Al-Mohanna F, Collison K, Zhu A, Stern E, Saido T, Tohyama M, Ogawa S, Roher A, Stern D (Oct. 1997). "An intracellular protein that binds amyloid-beta peptide and mediates neurotoxicity in Alzheimer's disease". Nature (ENGLAND) 389 (6652): 689-95. doi:10.1038/39522. ISSN 0028-0836. PMID 9338775. 41 Lefterov, I M; Koldamova R P, Lazo J S (Sep. 2000). "Human bleomycin hydrolase regulates the secretion of amyloid precursor protein". FASEB J. (UNITED STATES) 14 (12): 1837-47. ISSN 0892-6638. PMID 10973933. 42 Tarr, Philip E; Roncarati Roberta, Pelicci Giuliana, Pelicci Pier Giuseppe, D'Adamio Luciano (May. 2002). "Tyrosine phosphorylation of the beta-amyloid precursor protein cytoplasmic tail promotes interaction with Shc". J. Biol. Chem. (United States) 277 (19): 16798-804. doi:10.1074/jbc.M110286200. ISSN 0021-9258. PMID 11877420. 43 Study paper, a review at Alzheimer's Research Forum, and a news report: Hoe HS, Lee KJ, Carney RS, Lee J, Markova A, Lee JY, Howell BW, Hyman BT, Pak DT, Bu G, Rebeck GW (June 2009). "Interaction of reelin with amyloid precursor protein promotes neurite outgrowth". J. Neurosci. 29 (23): 7459–73. doi:10.1523/JNEUROSCI.4872-08.2009. PMID 19515914. http://www.jneurosci.org/cgi/pmidlookup?view=long&pmid=19515914. "Another Take on APP and Neurite Outgrowth—The Role of Reelin (Tom Fagan, 19 June 2009)". http://www.alzforum.org/new/detail.asp?id=2170. Retrieved 2009-06-24. "Protein linked to Alzheimer's disease doesn't act alone (www.sciencecodex.com)". http://www.sciencecodex.com/protein_linked_to_alzheimers_disease_doesnt_act_alone. Retrieved 2009-06-16.